Rusty Cauldron • View topic - Wood or metal? Just wondered if anyone has any thoughts/experiences to share? I too like to make things myself where I can, but am aware of my limitations and sometimes things just have to be made by others! Keep going with the wand though, that certainly sounds achievable. Let us know how you get on. Hi Southernwood, glad you're enjoying the wand work. I made my own wand too, and then started on a set of ogham staves each from the relevant wood. As you say, very tactile and meditative. I took a while to choose an athame. When I did, I hadn't seen any wooded options, although if I'd seen this kind of thing before I might have waited. As it was, a saw a paper knife in a local shop window, with a facetted glass handle. It was beautiful, and seemed just right, so that was the one. How's the wand coming along? I saw this thread and it reminded me of a plectrum I have been given. Someone I know had a few wooden plectrums, and they are SO tactile I could not put it down. So he gave me one to take home. Its beautiful and sits on my altar when not being used. I did find I had to sand it to improve the grip, then I oiled it to protect the wood. Such a small thing, but it increased the link I feel. If you have a look in the Wand section, there might be some info which would help there. Your plectrum sounds wonderful - any pictures? Hello sorry I've not dropped by recently, just been caught up with other things. Just did my reiki 1 last weekend which was great but I've been so tired since then I feel I could sleep for a week! Loved the wooden athames Helen. 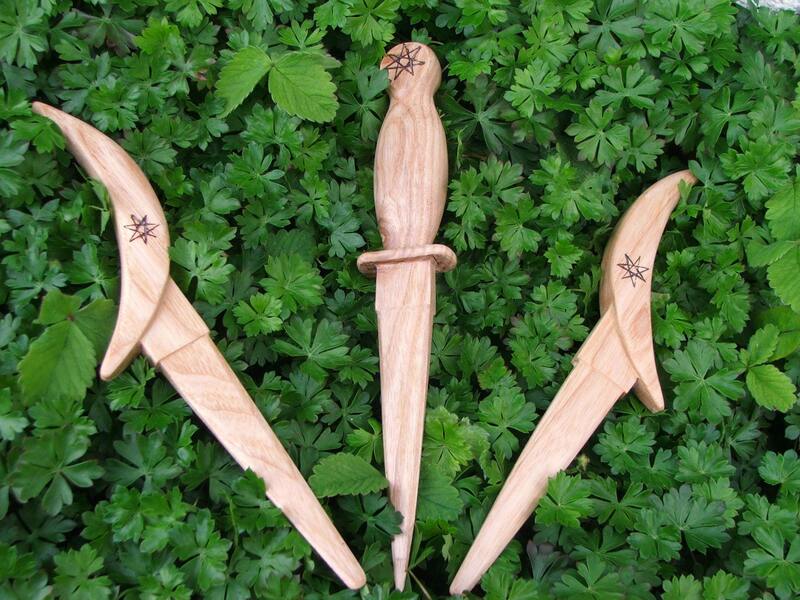 I've also seen some photos of flint blades/wooden handles which I really liked. I'll know when the right one comes along just like you did. Your wooden staves sound beautiful. Well Arablue the wand was coming along well and I'd been oiling it with essential oils and carrier oils and really connecting with it but I did think it was feeling a tad light. Anyway had left it on my bed one morning, went upstairs that night, forgot it was there, sat on it & the tip broke off . Now that says a lot about the size my bottom but I'm not sure if I'd dried the wood properly or not. It had been lying at the bottom of the tree for quite a while then I brought it straight into a warm kitchen to dry, who knows. I'll have another go and let you know how I get on this time. Hi Southern, Sorry to hear about your wand! At least you have gained experience from your first attempt, which you can use for your new wand. Thank you for the advice about wands, and woods. In the past I have tried to find fallen pieces where possible, but if I cannot, I have asked permission, taken gently & kindly and left things looking as natural as possible. I will take a look at the wands section and see where it leads me. I've added a photo of my plectrum for you. I've been having dreams about helping/healing people, including someone who can be psychically draining in my work life. And I also feel surrounded by indications that I am in balance with the powers, and the otherworlds. I feel uplifted by many things I see around me. I have a good feeling about what I am doing and thank you all for your support here. Last edited by arablue on Sun Mar 13, 2011 11:40 pm, edited 1 time in total. I have made a collection of different wooden wands, hazel, Oak, Hawthorn and Elder. all these I collected from each tree by requesting the tree for a wand size piece then wait a day or two and there they are waiting for me to pick up. I like to keep my wands seperate for definate works with in their correspondenses. not realy neccesary but I feel that while im making them if I will their uses it strengthens for what they are intended for. one thing that my grandmother taught me was to soak the branch in sea salt for twenty four hours prior to peeling off the bark and any sticking out bits. this actualy hardens the wood as well as cleansing it. then peel off the bark if required while wet. then dry it for two weeks before polishing it with either bees wax or as I use hair putty it leaves a lovelly sheen and is easily absorbed by the wood. To go back to athames, I made two one for my wife and one for me out of an old circular saw blade and some timber we had found whilst walking in the woods. For a first go they aren't too bad, the handles are nice, I left the bark on as they're supposed to be dark handled and it seems to have worn in nicely. The blades could be better, when I find some nice steel perhaps I'll have another go. I must admit that I'm a firm believer in knives being sharp, if I need to cut something for a spell ingredient then I use my athame to do it.